The inaugural Global Aviation Gender Summit was held from August 8 to 10, 2018, in the oldest city in South Africa, the coastal city of Cape Town. The summit had the backing of prominent aviation organizations, including host South African Civil Aviation Authority (SACAA) with support of the Government of the Republic of South Africa through the Department of Transport. The Summit was co-organized by SACAA and International Civil Aviation Organization (ICAO), in collaboration with the United Nations Educational, Scientific and Cultural Organization (UNESCO) and UN Women. Hundreds of people gathered at the event to create a roadmap for action to accelerate gender equality in aviation. Over two and a half days, representatives came together from all around the world to collaborate and have discussions on gender equality, cultural stereotypes, education (STEM), coaching and mentoring, the economic importance of women in the workplace, innovation, inclusion, diversity, and more. The importance of this conference and the indication that it was being taken seriously was evident by greetings from Poppy Khoza, director of civil aviation, SACAA; Smunda Mokoena, interim board chairperson, SACAA; Sindisiwe Chikunga, Deputy Minister of Transport, South Africa; Dr. Fang Liu, secretary general, ICAO; Papa Atoumane Fall, interim secretary general, African Civil Aviation Commission; and professor Hubert Gijzen, UNESCO regional director for Southern Africa. This summit was in line with the United Nations’ 2030 Agenda for Sustainable Development, specifically, Sustainable Development Goal 5 (SDG 5): Achieve gender equality and empower for all women and girls. SDG 5 is one of 17 SDG’s adopted on September 25, 2015, by heads of states at a special UN summit. It is a plan of action for people, the planet and prosperity; and aims to achieve sustainable development by 2030 worldwide, ensuing that “no one is left behind”. ICAO’s mission for this summit was to map out how aviation can contribute towards SDG 5 through gender equality. The aviation industry is one of the fastest growing industries in the world. The International Air Transport Association (IATA) expects 7.8 billion passengers to travel in 2036, a near doubling of the 4 billion air travelers expected to fly this year. An international shortage of airplane pilots is putting the air travel industry’s recent growth at risk. ICAO estimates that by 2036 there will be a need globally for 620,000 pilots. Aviation is a forward-looking industry that stimulates development, innovation and entrepreneurship. It connects people, cultures and businesses from across the globe and strengthens socio-economic development worldwide. The international air transport sector today supports the employment of 62.7 million people and contributes $2.7 trillion in global Gross Domestic Product. Furthermore, according to the latest forecasts presented at the summit, both air passenger traffic and air freight traffic are expected to more than double by 2034. The industry is having a hard time filling the positions, and it’s not just pilots. In terms of women serving in aviation roles, they make up only 6 per cent of all pilots, 2 per cent of aircraft mechanics, 17 per cent of air traffic controllers and 11 per cent of aerospace engineers. The industry wants to find ways to attract women into aviation to help fill the current and projected vacant positions. Finding ways to advocate for women to enter aviation is one way to help the industry develop and retain a competent workforce capable of meeting the needs and challenges of the global aviation community into the future. Women in aviation does not just help the industry, it helps women as well. The roadmap from this summit highlights four areas of recommendations to do just that: Policy and action plan, barriers and enablers, partnerships, and data. One example of a specific recommendation is to encourage leaders to become mentors. One recommended way of doing this is through the ‘heforshe’ campaign. It is an initiative that invites men – and people of all genders – to stand in solidarity with women to create a bold, visible and united force for gender equality. From a Canadian perspective, Transport Canada, NAV Canada and Elevate Aviation were on hand to represent Canada at the summit. 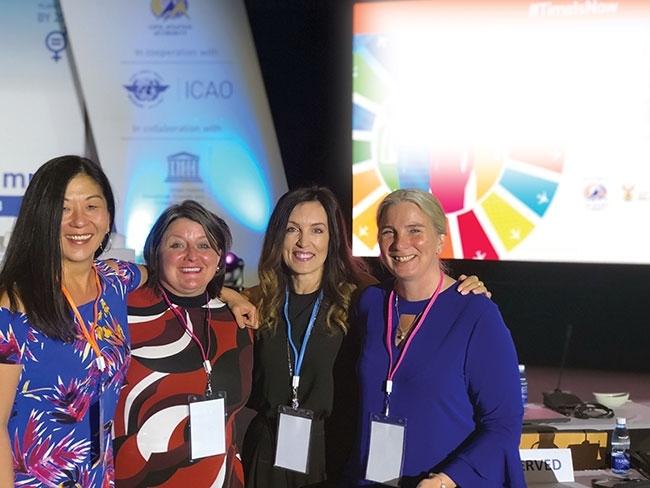 Associate Assistant Deputy Minister of Safety and Security, Transport Canada, Nicole Girard sat on a panel to discuss how to transform gender equality in aviation. She also brought greetings and represented the country during her speech at the gala dinner. Shari Currie, regional director general, prairie and northern region, Transport Canada, sat on a panel and brought her expertise on mentorship. From a personal perspective, it was an honour to be at this summit and learn from other organizations around the world. To be surrounded by such wonderful men and women, all with similar visions is empowering and uplifting. My hat is off to the organizers of this inaugural summit for bringing the aviation world together in the pursuit of gender equality.